• Gifts of Peace: 7 Days to Go! 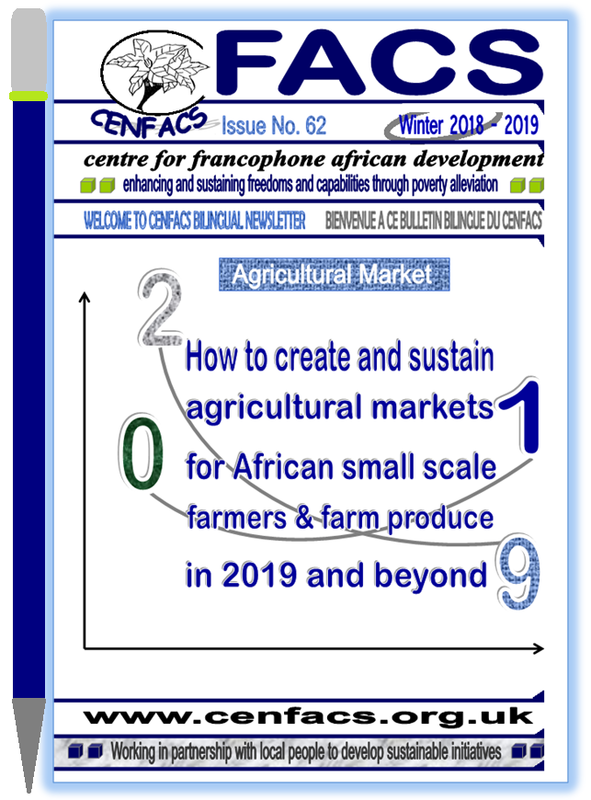 The lead content of this week’s post is How to Create and Sustain Agricultural Markets for African Farmers and Farm Produce in 2019 and Beyond. The key summaries of the 62nd Issue of FACS, which can be found under the Main Development section of this post, shade some lights about this lead content. The week is also about the continuation of our Digital and Social Media Campaigns. This time we are focusing on IT (Information Communications) and Online Security as a sub-campaign. Since the means of communications and their technologies went online and through the use of computer, there are always potential threats and risks of security of using them. Our users and beneficiaries, let alone ourselves, are not exempt from these threats and risks. The IT and Online Security sub-campaign is designed to address these issues by raising security awareness as well as helping to reduce poverty in these matters. We have noticed that many of our innocent users of computers and online technologies (i.e. IT and digital technologies) want just to get on running their daily life in using them by looking for information (such as finding a local shop, doing homework for kids, locating a local pharmacy etc.). But, they constantly face disruptions to their work to the extent that there is always a breach to their computers, networks and data; let alone their privacy. This sub-campaign, which is meant to address these issues, covers four types of security: IT, online, Internet and information security. The campaign aims at helping the victims of these threats and risks to reduce poverty in these matters by protecting their digital assets and network devices, learning risk management tools, reducing network infections and caring for their health, independently organising their own security and developing a basic security strategy or plan. 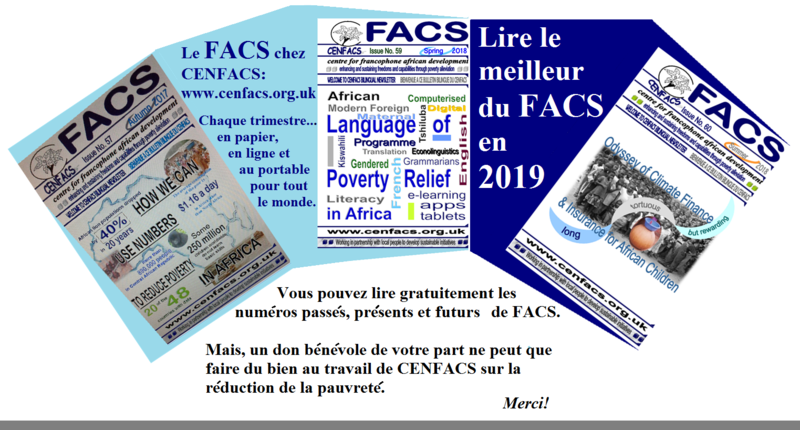 For more on this sub-campaign or the Digital and Social Media campaigns, please contact CENFACS. Gifts of Peace: Only 7 Days to Go! We have only seven days left for the Gifts of Peace campaign. We are appealing to those who have not managed to support to come forward and support this campaign. If you miss the deadline of the campaign, you can still donate as there is always there is a life out there that needs your support. We hope you will help as much as you can to keep our Season of Giving alive. Many thanks! We would like to thank you for your support for trying to do something for sustainable peace and hope prevail for the peoples of DRC who are going through a very delicate situation regarding their long waiting democratic transition. Many thanks! This is a new type of programme that is designed to work with our Africa-based Sister Organisations in places where countries have continuously been subject to emergency and contingency programmes (especially in places where there are long running wars and natural disasters) then moving from instability to stability. This new programme is a set of related projects oractivities with a particular long-term aim of reducing poverty induced by armed conflicts, wars, natural disasters and political instability where countries in which this programme is implemented are in transitional phase from instability (abnormality) to stability (normality). The programme, which can last between 1 and 2 years, is a detailed plan of action for transitional poverty reduction work that aims to achieve beneficial change through clearly defined outcomes. This project helps to fill the vacuum we had. So far, we had African Integrated and Sustainable Development Initiatives Programme (AISDIP) and African Rebuilding and Sustaining Infrastructures and Lives (RILIVES). The first is for countries where the risk of political upheaval and environmental disaster is considered to be relatively low. The second is where the risk is high. The new transitional development programme is where the same risk is moderate. You can turn your unwanted and unused goods into donations for poverty relief. CENFACS’ Charity e-Store needs your support for SHOPPING and DONATIONS. You can do something different this January by SHOPPING or DONATING GOODS at CENFACS Charity e-Store. At the beginning of this Winter, we published the abstract about this Issue. “How to Create and Sustain Agricultural Markets for Small Scale Farmers and Farm Produce in Africa” is an engaging theme in terms of both poverty reduction and sustainable development. It is an investigation on how farmers can deploy their ingenuity to create and sustain agricultural markets. It is a market-based solution to the problem of poverty by finding the tools, techniques, know how and adequate support to make market work for them. The 62nd Issue of FACS focuses on the retail sale side of fresh agricultural products. Let’s now see the key summaries making the body of this Issue. Poor farmers integrating market spaces like regional value chains (RVCs) can boost their capacity. Unless these chains do not exist for them, if they exist they can be a scope for the development of agricultural products (such as vegetables and fruits). These regional plans of action can provide them with the following benefits: new niches or opportunities on the African and global markets, the possibility of gaining trade integration, upgrading, adding value to produce, integrating value chain finance, achieving economies of scale and improving presence on the agricultural markets. Briefly, they will benefit from free trade areas and economies of scale. The above statement applies to African farmers and their produce as well. If this is true, then financing agriculture and farm produce in Africa could help small scale farmers to bring into existence market for their produce which is struggling to spread. If this is the case, there is a need to improve agriculture finance markets to reach remote rural populations and small scale farmers. Small scale farmers can have access to credit guarantee schemes, matching grants, gender finance and other financial support. This should be done together with financial instruments to manage and prevent risks for them without forgetting insurance programme. It is in this context that agriculture finance can eradicate extreme poverty. Some of our Africa-based Sister Organisations that are involved in sustainable agriculture and farming projects to help local people to reduce poverty need help themselves. One area of help is to empower them so that they can help themselves and help others. This empowerment can include many aspects such as finance, skills development, basic infrastructural development support etc. Powers include as well the capacity to negotiate agricultural markets and sustain them, to advocate their share of these markets and to make agricultural groups of action they belong to to work for their causes. Empowering them in this way will enable them to increase the agricultural market share. Where you get your information can determine the way you trade. 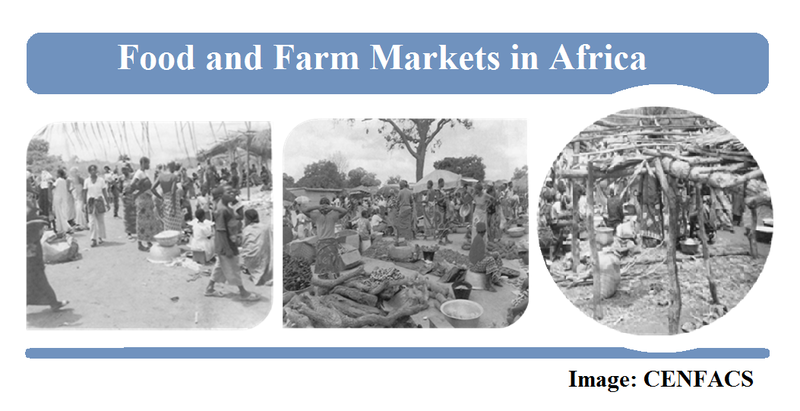 Agricultural market information is important input to boost your income generating activity. 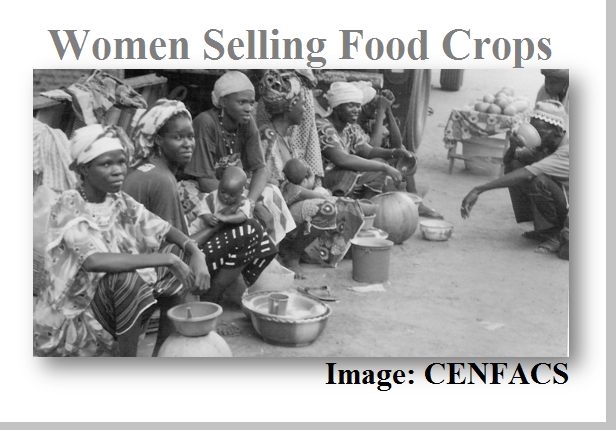 Agricultural market information can help female agricultural traders to better source their suppliers, develop their strategy for income generating activity. Market information can provide some knowledge about competition, awareness on prices, new comers in the market etc. There are many sources of agricultural market information such as newspapers, radios, TV, trade magazines, marketing intelligence, internet etc. How female traders get their information. This could a matter of an investigation. They may get them from contacts, fellow traders, words of mouth, social media, trade meeting, local press etc. Does this information reach all of them? Perhaps, there could be a need to make a new African case study to answer this question. In the dissemination of agricultural markets information, efforts need to be deployed to make sure that market information reaches all the traders including female ones. There is a need to improve the delivery mechanism of market information so that female agricultural traders receive it on time so that poverty in communication and market information is reduced. To eradicate gender-based discrimination towards minorities in the market of agricultural products, there is a need to address gender gaps in agriculture so that female farmers are adequately treated like their male counterparts. This tackling of gender gaps should be included in the product design and policy making. Like in many other sectors, gender inequalities in the agricultural sector exist. It is sometimes not perceived when it comes to small scale female farmers. Like there have been efforts to improve women’s earnings and participation in other areas of life, reducing gender inequalities (in access to land, market opportunities and technology) in agriculture can have a knock-on effect on poverty. Eradicating gender inequalities for small scale farmers and agricultural entrepreneurs (such as self-employed producers, farmers and non-profit organisation owners) is a good step forward to reducing or ending poverty in the agriculture sector and farm produce. Pour créer et consolider les marchés agricoles pour les fermiers et les produits cultivés africains, il faut évaluer leurs parts dans les marchés africains et mondiaux. Généralement, les fermiers et agriculteurs de petite taille d’activité ne pèsent pas beaucoup dans les négociations agricoles commerciales mondiales et panafricaines. Il y a plusieurs raisons dans cette faiblesse ou ce poids léger. L’une de ces faiblesses est qu’ils n’ont pas de forte représentation pour proposer leur cahier des doléances afin d’arracher des parts des marchés qui leur conviennent. Ils ne sont pas par ailleurs forts et suffisamment organisés pour répondre à la compétition parfois déloyale que leur font les grandes chaînes d’exploitation agricoles et de distribution alimentaire, qui les arrachent des parts des marchés et de la clientèle. Cela concerne aussi bien des marchés panafricains que des marchés nationaux où leur voix n’est pas proprement représentée. Cela veut dire qu’il y a nécessité qu’ils s’organisent et devenir plus parlant de leur cause. Tout ce qui est dit ci-haut doit être placé dans la perspective de réduction de la pauvreté. Car, les gens dont on parle sont des pauvres qui essaient de générer de revenus à travers une activité d’exploitation agricole. Ainsi, les parts des marchés qu’ils veulent créer et maintenir sont celles de la réduction de la pauvreté. Vendre un produit agricole, c’est une chose. Vendre à des prix qui permettent de couvrir des coûts financiers et dégager une marge financière pour réduire la pauvreté, c’est toute autre chose. Les prix dont on parle ne sont pas des prix exorbitants ou astronomiques. C’est plutôt des prix qui garantissent ou rémunèrent l’existence même du métier de fermiers africains et qui valorisent leurs produits. Encore une fois, nous parlons des gens ou individus ou encore familles nécessiteux et qui ne veulent rien d’autres que vivre des fruits de leur métier et de la valeur ajoutée de leurs produits. Ils ne demandent pas de faveur mais un prix rémunérateur qui assure le maintien de leur vie et de leurs produits. C’est ce prix-là qui leur permettra de réduire la pauvreté et la précarité au sein d’eux. While the handling of agricultural information and data via papers is still relevant, small scale farmers in Africa will benefit further by developing digital and online skills to cope with the amount of work they have and keep pace with technological evolution. This paperless or e-information handling will not only save money on papers, but it will move them closer to other agricultural markets and help them explore online ways of diversifying their customer base, lowering operating costs, accessing online information and support, using electronic payment platform to enhance information access and reduce transaction costs etc. This is as well good and great for the reduction of deforestation and adverse effects of climate change. Briefly speaking, paperless or e-information economy for African agricultural organisations means that they can save on papers, discover new pitches, create and sustain markets. As the science of agriculture develops together with other sciences (like digital science), it is advisable for small scale farmers and the way they produce keep pace with the scientific changing environment. The digital technology has penetrated all spheres and aspects of life. The agricultural and farming industries are not exempt from this penetration. While the powers of farmers in knowing land and way of producing crops remain relevant, there is as well a need for them to embrace these technologies, digital agriculture and farming. For the purpose of this Issue, we have selected two definitions to tell what they are. 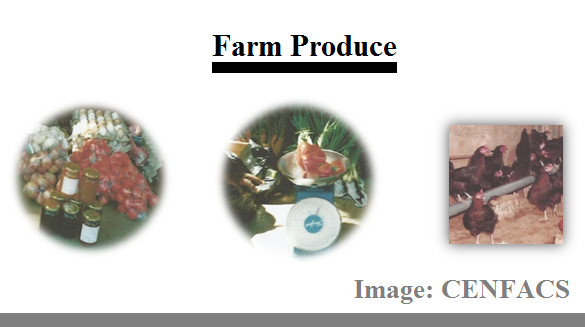 Small scale farmers can us these technologies to create and sustain agricultural markets for their farm produce (e.g. climate smart production). Each country in Africa has both a comparative and competitive advantage for its agricultural products. Taking the opportunity of these advantages by linking small scale farmers with African markets and buyers where they may detain a comparative or competitive advantage help to reduce poverty. They can learn how to sell their farm produce directly to African and international buyers. In digital and mobile phone worlds, it is possible to do it. It is even desirable to link small scale farmers and potential African markets for their produce. This survey is about agricultural market barriers. In order to understand the kinds of barriers that voluntary Africa-based organisations working in agricultural sector and looking to access markets for their produce to help reduce poverty, CENFACS is conducting a survey. The survey goes beyond the barriers they face by exploring paths for solutions and support. It will help to capture information and data agricultural markets, get the feeling about participants, get input for needs assessment regarding the solutions to market barriers, shape up policies and improve practice. 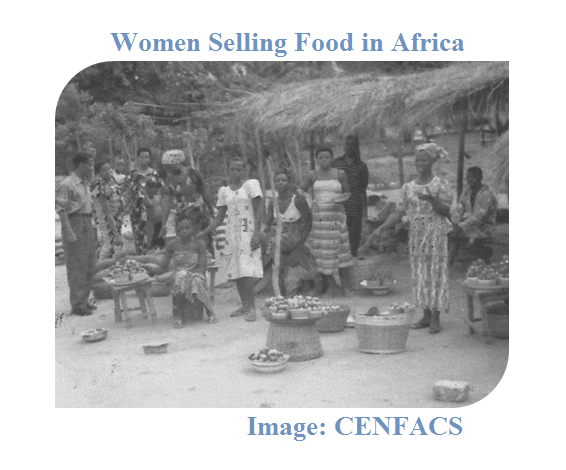 This survey is part of CENFACS Zero Hunger Africa campaign. For further details about this survey and to participate, please contact CENFACS. The AFAA project is a sustainable initiative aiming at reducing food poverty and related issues (malnutrition, undernourishment, sanitation etc. ), linked to the lack of food and its unfair distribution in Africa. The project will achieve its aims via agriculture and farming. Agriculture has always been said to be the mother of priorities when it comes to feeding people and providing for other needs and demands in society in Africa. Especially for rural populations, agriculture and farming are vital. Given the potentials that Africa has in agriculture, it is possible for agriculture to feed Africa and leave no one body hungry or without agricultural food. And most of Africa’s economies are agriculture-based ones. Briefly, this is what this project is about. For the full project proposals, please contact CENFACS. For a paper copy and any enquiries regarding the 62nd Issue of FACS, contact CENFACS.